The red socks are ready, the sheep are shorn, the True Blue parade decorations and quilts display are underway and the entertainment including, bush poetry and Ka Boom fireworks is on the way to Merriwa for the Rosto Festival of the Fleeces, 9 to 11 June 2017. Pick up your Rosto Festival of the Fleeces program, available at the Merriwa and Scone Visitor Information Centres or on the website www.festivalofthefleeces.com.au. Most of the events and attractions are free. You can also buy your ticket for the opening night. Chair of the Festival of the Fleeces Committee, Councillor Ron Campbell said the organising committee had done a great job. “We’re hoping for true blue skies for the June long weekend, which will be packed with all the fun and family entertainment of Merriwa’s biggest event. “Attractions include the Grand parade on Saturday led by the red-socked sheep, performers, stalls, dog high jump, the Hanging of the Quilts at Merriwa School of Arts, team penning and the Ka-Boom fireworks finale at the Merriwa Showground. “It’s a great weekend to invite friends and family to see our town at its true bluest,” Cr Campbell said. Wear a ‘true blue’ outfit for the Opening Night event at the Merriwa RSL on Friday 9 June featuring music from party band ‘Everyday People’ and a performance from Ellerston grazier and bush poet Tim McLoughlin. Book your tickets through the Merriwa VIC. 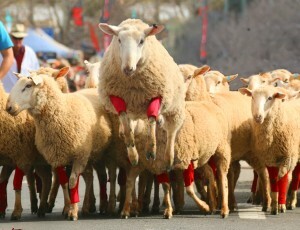 Saturday is the biggest day of the festival with all the fun of street markets and entertainment from 8am and the Grand Parade led by a flock of sheep in red socks running down the main street of Merriwa from noon. Entries are in for the True Blue window decorations and all the stall places are filled, so there will be plenty to see and do. Comedian and street performer Sean Murphy will be there and performance troupe the Waste Wrappers are back juggling, uni-cycling and singing about the right way to recycle. Comedian Sean Murphy, of Kids’ Party Confidential, will be roving through the crowd on Saturday equipped with modelling balloons, and bringing a street-theatre style of comedy to every corner of the festival. Kids and adults will laugh a lot, cringe a little, and learn how to tie a serious balloon sword. ‘Hanging of the Quilts’ is back at the Merriwa School of Arts thanks to local quilter Lenore Taylor. Buy a raffle ticket for your chance to win a beautiful hand crafted quilt made by one of the region’s best quilters. Saturday afternoon the action moves to the Showground, including team penning activities and entertainment from 3pm through to the big finale at 6pm with Ka-boom fireworks. Sunday morning is the Bush Poets Breakfast where amateur and experienced tale-tellers will compete for applause and five hundred dollars in prizes. The event will be emceed by Tim McLoughlin. To enter the Bush Poetry competition contact the Merriwa VIC on call 6521 7046 or just turn up on the day. Support the Festival by buying tickets in the major raffle with first prize courtesy of Village Roadshows, a four 4 night stay for a family of four at eco farm stay resort, Paradise Country on the Gold Coat including a great night out at the famous ‘Outback Spectacular’ show. Other prizes include a three night stay at the Mantra Aqua Resort at Nelson Bay, a packaged whole lamb donated by the Campbell family, and a $100 voucher from Merrifield Farm. The raffle will be drawn at the Opening Night event at Merriwa RSL. You don’t need to be there on the night so get along to Merriwa VIC to buy your tickets now. The festival raises funds for the Volunteer Rescue Association and Westpac rescue Helicopter. Thanks to all the supporters and sponsors including platinum sponsors Rosto Olives, Coal and Allied and Upper Hunter Shire Council.